Becoming the proud owner of a new or used Nissan is a memorable experience that begins a lifetime full of smiles, memories and journeys. At our Nissan dealership in North Aurora, IL, we’ve been connecting customers with the Nissan that’s right for them and their budget since 1998. We’ve been family-owned and -operated by three generations of the Gerald family, and have historically stood for integrity, honesty and the highest standard of excellence and customer care. We pride ourselves on treating our customers with respect and displaying a fierce dedication and loyalty to serving their needs. To prove it, we offer our Gerald Exclusive Lifetime Warranty on every new Nissan and select used Nissan models for no extra charge! This warranty features a lifetime warranty coverage, no limit on miles or time and the option to service your Nissan at any Nissan dealer in the country. We fully understand that our success is heavily due to our loving and supportive community, so to show our gratitude, we’ve continually donated our time and money back to local organizations for the past 70 years. We firmly stand behind the efforts of our local organizations and charities because we value the betterment of our community members, too. Our dedicated team has donated to Hesed House to provide food and shelter to the homeless, Living Well Cancer Resource Center to promote cancer research and we’ve even sponsored local soccer clubs like Campton United Soccer. We simply cannot say thank you enough! 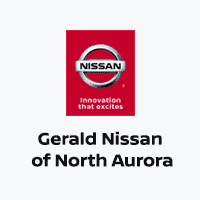 Why You Should Buy from Gerald Nissan of North Aurora? No one can top our hometown pride, and to show our support, we’ve sponsored the Batavia High School Bulldogs — just view their scoreboard to see our name!